- ( by Lonnie Dai Zovi ) There are 36 different expressions illustrated for these useful bingo cards. For the larger class, there are 34 different cards. If there are more students in the class, have a student be the caller or a few student may take turns sharing a card. These can be used as review or actually as instruction because the students see the picture on the calling card as the teacher or caller says the expression. The calling cards are written in English, Spanish, French, German, Italian, Arabic, Chinese and Japanese. Of course teachers of Hebrew, Latin,Urdu, Tagalog or other less commonly taught languages can use these pictures and add their own translations and then use the Expressions Bingo game. (The students’ playing cards don’t have any language written on them, only the pictures. ) 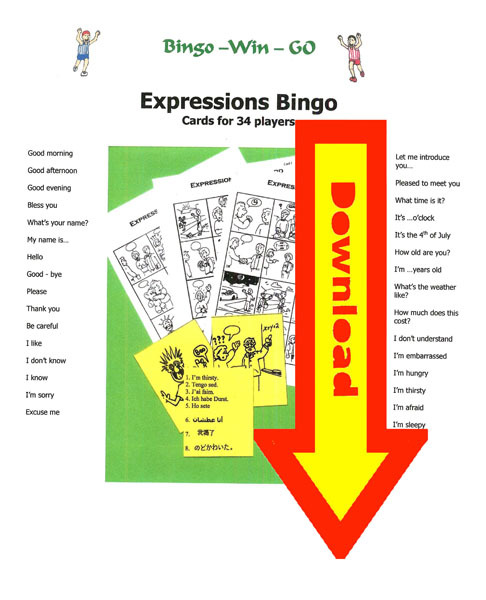 There are instructions for playing bingo and suggestions for variations of the game.